As the word “snow” begins to enter the vocabulary of the meteorologists around the Kansas City area, many home and business owners neglect repairs until the weather improves. However, many repairs, including concrete repairs, can be completed before, during, or after the cold weather months. In fact, when winter hits, it will be more difficult to repair the concrete with the natural elements, de-icing chemicals, and additional cracking due to the temperature and moisture fluctuation. 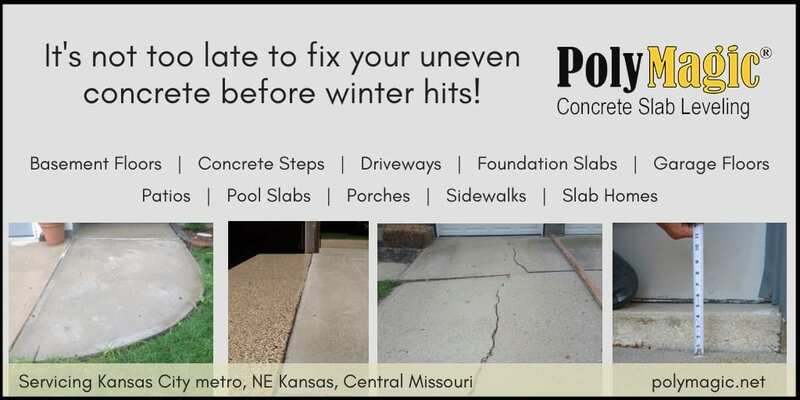 For many reasons, including the few listed previously, now is the perfect time to repair your concrete before winter hits. PolyMagic continues to see the correlation between cold weather and concrete repairs. Homes, apartment complexes, buildings, and businesses have concrete surfaces that are exposed to all weather elements, specifically cold weather. The exposure of varying temperatures and moisture can cause additional concrete cracking from frozen water expanding the pores of the concrete. As a result of the cyclical freezing and thawing of the rain, snow, and sleet rupturing concrete is very common in the Kansas City area. Another factor to consider when looking at why to repair your concrete before winter hits, is that Midwestern winters can bring ice, which is commonly combated with de-icing chemicals. The chemicals can cause concrete to flake and break off into chunks. 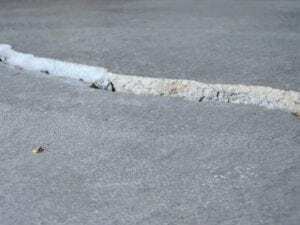 The concrete crumbling can worsen uneven concrete and tripping hazards. Many areas of Kansas City homes and businesses can be affected by the settlement and shifting, including driveways, sidewalks, garage floors, steps, basements, pool slabs, foundation slabs, and more. 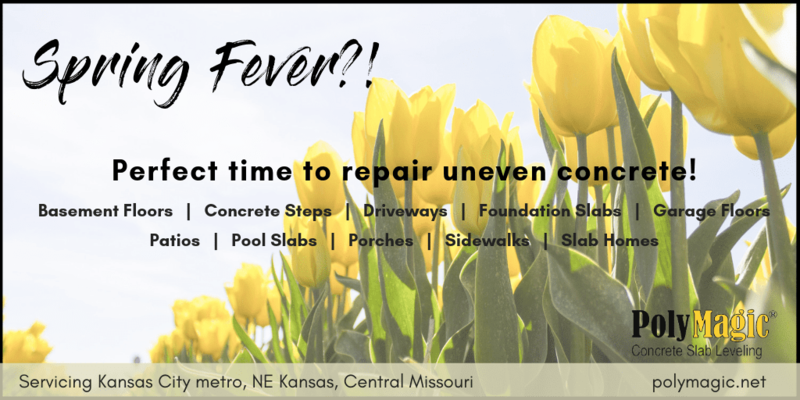 There are many concrete repair companies within the Kansas City area, but not all specialize in polyjacking, which is a process of injecting high-density polyurethane foam into the concrete. This is a more cost-effective solution compared to mudjacking, and can have many additional benefits. Continue reading about the main differences in mudjacking vs polyjacking. Polyjacking, or poly leveling, is the most effective form of concrete repair. The key to polyjacking is to do your research on companies that are reputable, honest, and experienced. Check out additional benefits of polyjacking here. PolyMagic will provide a stable and accurate solution to your concrete repair needs around the Kansas City, NE Kansas, and central Missouri areas. The PolyMagic team is experienced, knowledgeable, and solutions-based, and wants to respect your time. A new quoting tool was implemented on the PolyMagic website, https://www.polymagic.net/request-a-quote/, that allows you to upload pictures of your project so our team can provide an accurate estimate within a timely manner, all while allowing you to proceed with your daily routine! A warranty can have so many different meanings to residential homeowners. As the go-to polyjacking company in the Kansas City area, PolyMagic wants to offer some points of consideration when comparing bids and specifically the warranty options. Let’s look at three key elements to consider when reviewing bids from concrete repair companies. Have you researched the company on Google reviews? Are there any specific reviews that refer to warranty work? Any concrete repair company can promise an overextended length of time on the warranty, but will they truly honor that? Ask the concrete repair company for references or their past few customers to call and inquire about their experience with your team. Over 75% of new businesses close within the first three years of operation. You may want to evaluate if a correlation between a lower estimate you receive from a concrete repair company and the length of time in business exists. Are the two related? Again, do your research and look at Google reviews to get some real feedback! When reviewing the differences in a polyjacking warranty for each company you are considering, be sure to review the fine print, including the clauses. Most warranties offered by polyjacking companies include clauses that reference drainage, water flow, and acceptable deviation. Be sure you’re aware of the clauses and if you have questions or concerns, address those before committing. I would recommend this company in a heartbeat. In this day and age, when so many companies don’t fulfill their work, or treat you like you’re just money in their pocket, PolyMagic goes above and beyond to satisfy you, stand behind their work, and treat you like a friend. I had a young man, named Jerry come out last year, and polyjack my sidewalk and the pillars on my front porch, which had settled into a void. They did a wonderful job, were polite, and fulfilled all the questions I had. Well, with a terrible drought that we had this past summer, the pillars on my porch started sagging again…..I made a call to Vince, the owner, sent him pictures of what was going on, and, he sent Jerry back out. Not only was he here exactly when he told me he’d be, but he also took care of my problem at hand. No extra charge…they stood behind their warranty from the work they did last year. Not only is the drought not their fault, nor the soil pulling away, but they felt like they needed to stand behind their work. I give Jerry and the company 5-stars, and, beyond. Thank you, guys! As the weather begins to change, be sure you’re armed with the right company to take on your Driveway and Garage Repair the Polyjacking Way! Now is a great time to repair uneven concrete problem areas before the change in weather worsens the existing trip hazards. One area that is a common issue for many homeowners in the KC area is the garage and driveway. Take a look at this project PolyMagic just completed for a residence here in #KansasCity. Five inches of concrete was raised by the polyjacking technique and expertise the PolyMagic crew brings to each project. PolyMagic has outlined the benefits of poly leveling when comparing to mudjacking. When you begin searching for a reputable concrete repair company, it’s imperative that you know the right questions to ask. Check out this article on Questions to Ask a Concrete Leveling Company. In the meantime, be sure you have completed your due diligence in learning about the difference in mudjacking and polyjacking. This is important to truly understand the benefits that polyjacking can have for your uneven concrete surfaces including: basements, foundation slabs, concrete steps, driveways, garage floors, patios, pool slabs, porches, sidewalks, and slab homes. Cost Effective– Concrete raising is typically about 33% less than replacing the same concrete. Ultimately, the cost of raising or stabilizing concrete is a direct reflection of how much leveling material the project will require. Time– Ready to use immediately. Clean Work Environment– No concrete or grout splatter and no wash down needed. Smaller Holes– Polyurethane concrete raising drills a nearly invisible 5/8 inch hole and the process calls for considerably fewer holes than traditional mudjacking. When finished, minimal patchwork is needed. Lightweight– This material will never lose density. It is permanent and weighs only about 2 pounds per cubic foot. Compared to traditional mudjacking that weighs about 100 pounds per cubic foot. Green– Polyurethane is environmentally friendly. It consists of 39-49% renewable and recycled materials. Are you ready for a quick, accurate quote? Our new online quoting tool allows you to upload pictures of your project so we can get a better understanding of the repairs needed, AND we save you time! Let us help you! PolyMagic continues to push the envelope, and this time it’s a tool that benefits you… Concrete Repair Quotes to Save You Time. PolyMagic wants to save you time, money and frustration, so we’ve implemented a new estimate tool on our website that allows you to upload project pictures. This allows our team to review the pictures and assess the project, so we can call you with the correct information. Your time is valuable, and we aim to respect it as much as possible. Get started on a quote today, but before you do, take some pictures of your problem area. Consider taking pictures of the full project scope, and some additional close-up pictures. The more pictures, the better when we’re trying to quote your project. We look forward to working with you! When it comes to home repairs and concrete unevenness, it’s key to find an effective way to lift concrete slab floors, without a costly, timely, and ineffective procedure. The need to find an experienced company that has done extensive and successful concrete slab lifting is crucial. 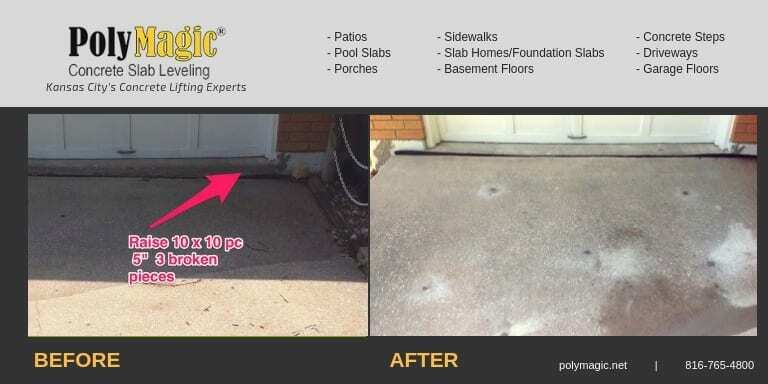 PolyMagic, a leading concrete lifting company in the Kansas City area, recommends finding a skilled company to use poly-leveling technology for in-home repairs. Tripping hazards within the concrete in your home are not only dangerous for others, but can also be costly if handled incorrectly by a contractor. 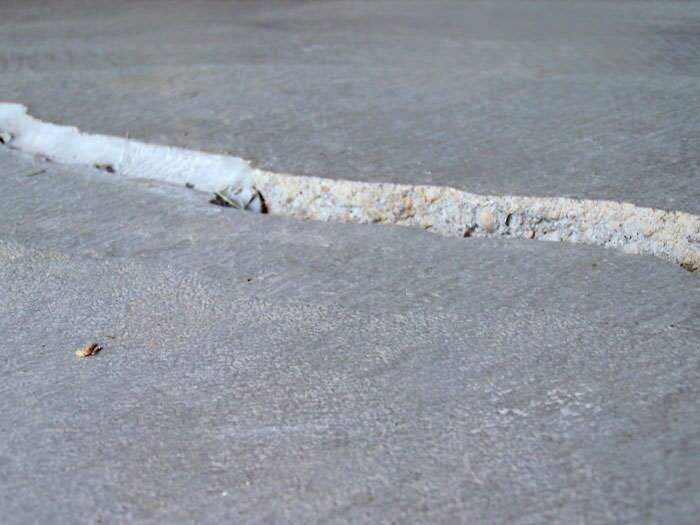 Cracks and uneven concrete are typically found within your concrete slab floors, and can be in the hard-to-reach areas. In addition to the appearance and safety issues, your home loses value when you decide to sell. PolyMagic has several reasons they recommend poly leveling as the most effective method of lifting. The first reason is that the polyurethane machine only needs to very small area to drill a hole into and get the job done. PolyMagic’s polyurethane foam method uses the concrete slab as a means of delivering poly foams that raise concrete, fill voids, and stabilize soils. A 5/8” hole is strategically drilled through the slab into the subgrade. Then, a tapered delivery port is installed into the hole. The injection gun is connected to the port, releasing polyurethane material through the port and slab. Expansion of the material occurs within seconds, raising the concrete. The second reason that utilizing poly is an effective way to lift concrete slab floors is the clean work area. The poly holes are very small, and the mess is very minimal. The last thing you want inside of your home is a huge mud trail and equipment needed to perform mudjacking. This is not the ideal situation for an in-home project, and some mudjacking companies even refuse to complete work inside of a residence because of the mess. The poly leveling allows experienced companies to come into your home, and even in the tightest areas, perform the lift needed without the heavy equipment, dust/debris, or multiple-person crews running in and out of your house. At PolyMagic, our experienced technician drills a few penny-size holes through the sunken slab in each of the affected rooms. 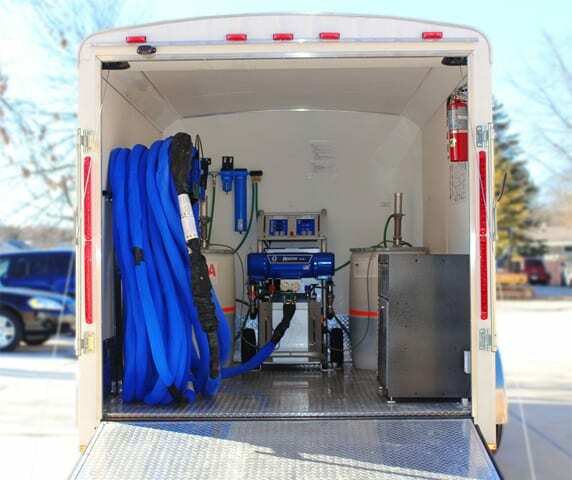 He then pulls in a hose from a box truck parked in the driveway of the home, and injects the polyurethane solution. The solution spreads under the slab until it begins to expand. The foam gradually raises the slab to its original level position. The third reason for utilizing poly as an effective way to lift concrete slab floors is cost effectiveness, and time, which essentially go hand and hand. Utilizing polyjacking, instead of concrete repair, in the slab floor situations saves over 33%. The surface is able to be used/walked on immediately after the polyurethane has been completed. Read the additional benefits of polyjacking. 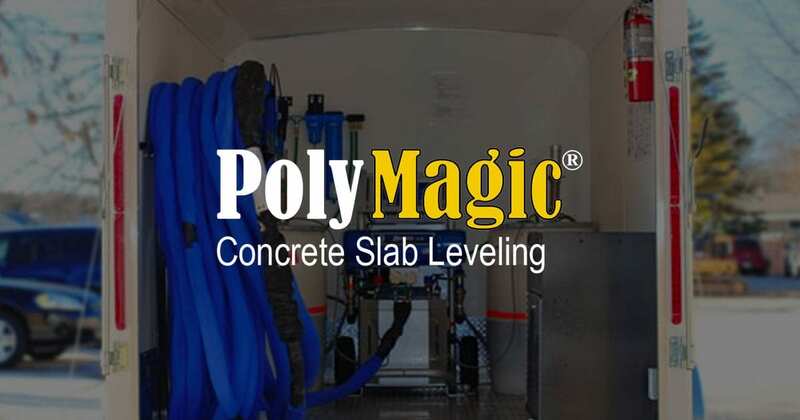 As a leading mudjacking and polyjacking company within the Kansas City and NE Kansas area, PolyMagic has outlined the benefits of poly leveling when comparing to mudjacking. When you begin searching for a reputable concrete repair company, it’s imperative that you know the right questions to ask. Check out this article on Questions to Ask a Concrete Leveling Company. In the meantime, be sure you have completed your due diligence in learning about the difference in mudjacking and polyjacking. This is important to truly understand the benefits that polyjacking can have for your uneven concrete surfaces including: basements, foundation slabs, concrete steps, driveways, garage floors, patios, pool slabs, porches, sidewalks, and slab homes.